The development of tiny calcium deposits, or stones, within a salivary gland is called sialolithiasis, or salivary gland stones. The majority of the stones affect the submandibular glands located at the floor of the mouth, and can block the flow of saliva into the mouth. The condition does also, however, occasionally affect the parotid glands, located on the sides of the face, or the sublingual glands, which are under the tongue. 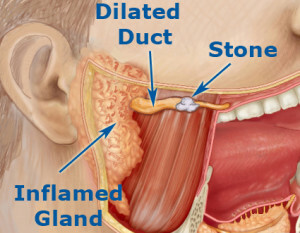 Salivary duct stones affect about 1 out of 100 adults, twice more men than women, and many people with the condition have multiple stones. The size of the stone can vary from less than 1mm to a few centimeters in diameter. About 9 in 10 stones are, however, less than 10mm in size. The reason why a stone forms is not known, but we do know that salivary gland stones are not usually associated with any other diseases. Some experts think that inflammation, irritation, and some medicines increase the risk of developing them, but we do not know for sure. 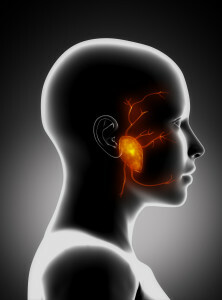 We do, however, know that some people are more likely to form salivary gland stones than others. Sialadenitis, or salivary gland inflammation, is an often painful bacterial infection of a salivary gland. The condition, which most commonly affects the parotid gland, may result when the duct into the mouth is blocked. Sialadenitis creates a painful lump in the gland, and foul-tasting pus drains into the mouth. Sialadenitis most commonly affects older adults with salivary stones, but can also occur in babies during the first few weeks after birth. Those who have xerostomia (chronic dry mouth), or suffer from anorexia, may also be prone to the condition. Swelling, pain, fever, and chills are frequently reported symptoms of the disease. If left untreated, salivary gland infections can cause extreme pain, increased fever, and pus collection. Sialadenitis may be subdivided temporally into acute, chronic, and recurrent forms. Predisposing factors of acute sialadenitis include decreased flow, poor oral hygiene, and exacerbation of low grade chronic sialadenitis. Common symptoms are painful swelling, reddened skin, low grade fever, malaise, leucoytosis, edema of the cheek, and purulent exudates from duct punctum. The acute form occurs in a patient that has either no previous parotid infection or very infrequent, comes on quickly with swelling, redness and pain; it requires antibiotics as well as other measures. The chronic form occurs due to blockage of the ducts, which results in swelling after eating; this happens because when the person eats and produce a lot of saliva, due to the blockage (caused by stones or scarring of the duct from infection) the saliva backs up into the gland causing swelling and pain. This usually goes away after a few hours and recurs after eating again. The best way to prevent this problem is to increase your water intake, and treat the salivary gland infection immediately. For those with chronic sialadenitis that is very symptomatic, a surgical removal of the gland may be the only treatment option that will provide sufficient results. For these patients, we recommend a superficial parotidectomy or submandibular gland excision. Schedule Your Initial Consultation With Dr. Larian Today. If you experience symptoms of a salivary gland stone, you need to schedule a consultation with Dr. Larian. He will perform a physical exam, and confirm his diagnosis with a CT scan. Stones that are at the outer most portion of the duct can be squeezed out, but those that are deeper in the duct may be removed with Sialoendoscopy. When a stones is in the main substance of the gland, if conservative measures like increased water intake and massaging don’t help, then it may require the whole gland to be removed. If you are showing symptoms of salivary gland stones, surgical removal of the gland might be necessary. To find out more, schedule a consultation with Dr. Larian today by calling (888) 687-6118. Next, learn about parotid cysts.